Recently I discovered a new golf site in the UK – Findthefairways.com. How did I discover it? Well, I was “tagged” by them on behalf of Natalie Gulbis in their “Bag tag – what’s in your golf bag” contest. Cool! What else is in your bag, Golfgal? Some extra Blingo ball markers from Charlotte Campbell from Highway 18 – so beautiful! I can’t imagine putting my hand up to my cap and not finding one there. So I always carry extras in case I lose mine. And it doesn’t hurt to have an extra for a new GF you meet on the links. 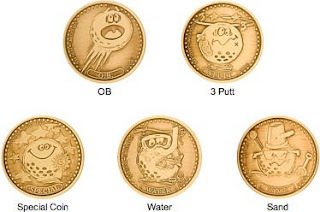 Also, I love my golf coin game. It was given to me by a male friend who loved to gamble on the links. Golf betting is the favorite pastime of almost every male golfer I know. The women I play with don’t like gambling for cash as much. But they love the coin game :). Money exchanges hands at the end, but it’s about “shots”, not about the scores. favorite course. My current golf tag is from Talking Stick Golf Course in Scottsdale. I love tags that bring back great emotional memories. They remind me about what’s important – love what you do, and love who you do it with! What’s the oldest thing in your golf bag?A Nature Valley almond bar from a year ago. Someday I will eat it when I’m starving on the course. Or maybe feed it to the 3-legged squirrel that lives on the par 3, 7th hole at UBC. No question…my absolutely favorite “go to” club is my Sweet Spot 4 hybrid. If I could only play with 1 club all day, it would be a no-brainer for me to grab that club. It is great off the tee, in the long rough, off the fairway, in the fringe and I bet I could even putt with it. I just love it! Over to you ladies…What’s in your bag? I need to check out those gorgeous ball markers. Love your Shankerella comment. Do it myself when I get all wound up. Your swing doc fixed those precious 6 inches between the ears in 15 minutes? I need doc’s number.